Reaction Engineering clearly and concisely covers the concepts and models of reaction engineering and then applies them to real-world reactor design. 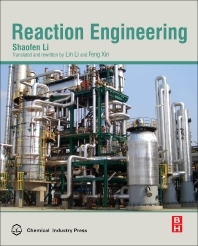 The book emphasizes that the foundation of reaction engineering requires the use of kinetics and transport knowledge to explain and analyze reactor behaviors. The authors use readily understandable language to cover the subject, leaving readers with a comprehensive guide on how to understand, analyze, and make decisions related to improving chemical reactions and chemical reactor design. Worked examples, and over 20 exercises at the end of each chapter, provide opportunities for readers to practice solving problems related to the content covered in the book. Prof. Li was a distinguished teacher in China and twice won the state excellence teaching award. His book, “Reaction Engineering”, won the highest award in the excellence undergraduate textbook category, an award organized by the Ministry of Education of People’s Republic of China in 2002. Li has published three textbooks about chemical reaction kinetics and reaction engineering, and more than 70 research papers in the field of reaction engineering. Prof Xin has taught the reaction engineering course since 1997 at Tianjin University and is in charge of the State Elite Course. His research focuses on reaction engineering, on which he has published more than 60 papers. Lin Li, Staff Research Engineer at Chevron Energy Technology Company, Richmond, CA. PhD in Chemical Engineering from Tianjin University, Tianjin, China, 1989. Worked 9 years at Dept. of Chemical Engineering at Tsinghua University, Beijing, China. He moved to the US in 1998, and after research experiences at Princeton University and UC Berkeley he joined UOP, Des Plaines, IL, in 2001 as R & D Specialist. He has published 1 book, more than 40 journal papers and many technical presentations. He also has 4 Chinese patents, and 12 US patent/applications.